Even though new technologies enable people to do much more with the Web, in the end HTML, XHTML and CSS are still at the root of any Web site. The newest edition of this bestselling guide is fully updated and revised for the latest technology changes to the field, including HTML5 and CSS3. Illustrated in full color, this book provides beginner and advanced coders the tools they need to be proficient at these programming languages. 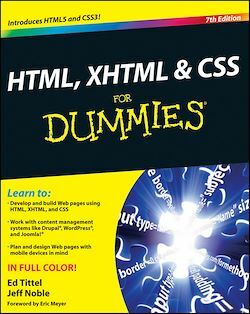 Written by two veteran computer whizzes, HTML, XHTML and CSS For Dummies will help you get the design results you want!